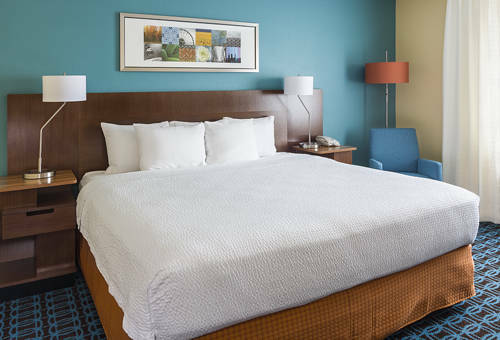 We welcome all travelers to experience our Fairfield Inn & Suites Branson hotel. Located just across the road from the Titanic Museum, our hotel in Branson, MO promises to satisfy each guests lodging needs with our premiere location, dedicated staff, and guest-oriented amenities. After a visit to the Titanic Museum, stop by the Hollywood Wax Museum, followed by some fun at the White Water Amusement Park. Experience Ballparks of America, just 5 minutes from our Branson hotel, and get some quality shopping done at Tanger Outlet Mall. Each morning is an opportunity to feast on our complimentary hot breakfast, with options for any breakfast preference. After a day exploring Branson, wind down in our indoor pool, and connect with family using our free wireless high speed Internet. At the Fairfield Inn & Suites Branson, you're our #1 priority. We promise you'll be satisfied, or we'll make it right. That's our commitment to you. Ask us about The Fairfield 100% Guarantee.